Have you ever heard of Nasi Lalapan? Do you kno where you can eat this? 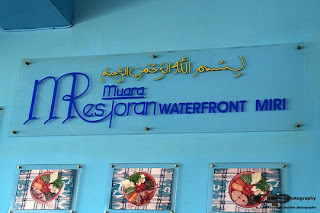 well it is getting more and more places with this dishes now but one of the very first place who started off this dish is no other than Muara Restaurant which locate somewhere near Yi Ha Hai Restaurant which is at the shop lot along the Miri river. Originated from Indonesia, the trend has come all the way to Miri and it is among the great favourite of Mirians who like spicy food. What you can on a big plate are cooked cabbage, some sort of green leave vegetables wihch i have no idea what it is, cooked long beans, fresh cut cucumbers, lime, deep fried beancurd, deep fried tempeh (which is actually made of soya beans if i am not mistaken) and of course, the sambal which is at the middle. Sambal taste is kind of spicy and at the same time with a bit of sweetness. Oh i forget to say, it comes with the choice of meat varies from chicken, beef or fish. Served along with a plate of plain rice and if i can remember well, with a bowl of soup of the day. If you never, you should! 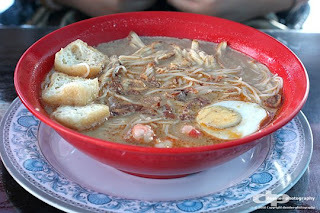 They also serve some other dishes as well like laksa which looks quite promising and it smells good too. So whyy wait? Go there now during the coming weekends and try this wonderful dishes that i have found for all my readers! I tried it twice ! Its a nice experience .. away from something different. Truly exotic !! Chicken and beef only ar? hmmm... shall have fish varieties ley, last time me always order tenggiri nasi lalapan during friend outing..
it's been a while didn't go.. will be fourth visit lo if go this time.. They served fish last time I went. The food was and I hope still is good. The sambal belacan is great. It's worth the money paid. Well, Compare to previous price, currently the prices of the foods in Muara seems to be increased! i tried recently. Preciously pricing of foods should be reasonable but currently price unreasonable & expensive. Dont know Wat was the reasons of it as oil prices alrdy depreciated. Any recommendations & comments! pls give! thanks! Ya I agreed your comments, the foods there was getting expensive! a normal lalapan for a person plus drink will cost at least RM12. Expensive! yep, they have increased the price..the last time i went there and ordered my alltimefavorite lalapan bawal, it costs me freaking rm17!!aish.. thier mee goreng not bad lar..! service ar..lose lor..feel like some v sombong..